Heard about Gangnam Style? Sure you have. It is very difficult, if not impossible, to not have heard about it. It is all over the news. Again. This music video was uploaded on YouTube on 15th July, 2012. On 30th May, 2014 it crossed two billion views on the site. There were many things that worked in the video’s favor and in this article I will take a look at those things. But first, a bit of a background. Park Jae-sang who is popularly known as Psy was born in 1977 into a rich family in the Gangnam District of Seoul, South Korea. In 1996 he went to USA to study business as he was expected to help the family business of manufacturing semiconductor equipments, but he lost interest in studies and spent his time and money on music. He took admission in Berklee College of Music but dropped out soon and returned to South Korea to pursue a career in singing without any university degree. In the year 2001 Psy launched his first album named “Psy from the Psycho World!” The album proved controversial and the South Korean government fined him saying the contents of the album contained “inappropriate content”. Then some of his other albums too created controversy. In July 2012 he launched his sixth album named “Psy 6 (Six Rules), Part 1” which contained the song Gangnam Style in it. In an interview Psy conceded that it took him only 48 hours to create the video song. Surprised? You won’t be if you will look at the video. It is just 4 minutes 12 seconds long. There are no special effects or expensive camera tricks involved. Also, the places shown in the shoot are no extravagant locations. They are just different parts of a city – parks, roads, trains, and even toilet seats! Although the song is in Korean so I didn’t understand the wording but judging by what people are saying about it, I believe the song is a humorous mockery of the places and people of Gangnam. YouTube has joined the celebrations along with the rest of the world. 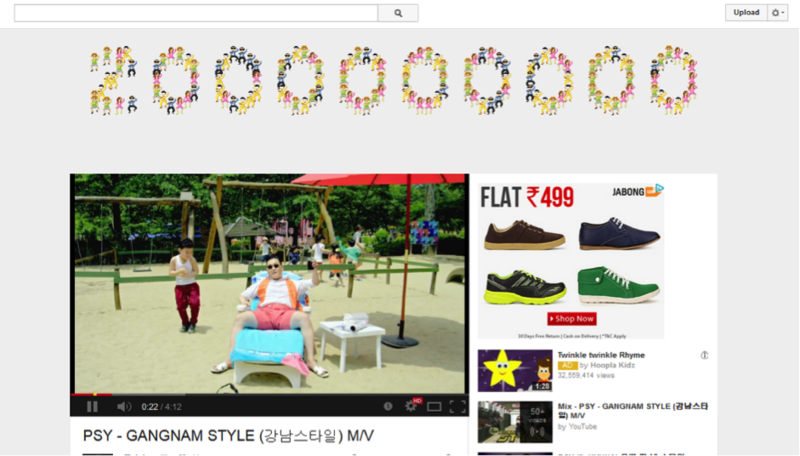 After all Gangnam Style is the first video on the website to reach two billion views. They are displaying two small icons of a dancing Psy next to the view counter as shown in the screenshot below. If you will click on either of these icons, the screen would display the two billion number, as shown below, composed of dancing people. Now that introductions are over, let me begin the story on how the video became so successful. It all started in February 2012 when some South Korean music industries along with YG Entertainment, the agency which represents Psy, announced that they want to enter the American market. Even before Gangnam Style went viral, YG Entertainment had millions of subscribers to its YouTube channel and its different artists had huge fan following on Twitter. Also, they must have had a large number of email subscribers, the data on which is inaccessible to us. Such numbers are necessary to kick start any marketing campaign. They knew that because of their large following they will get huge number of views right from day one. They also knew that once Gangnam Style starts getting huge hits, the media will come to them and they won’t have to approach the media. 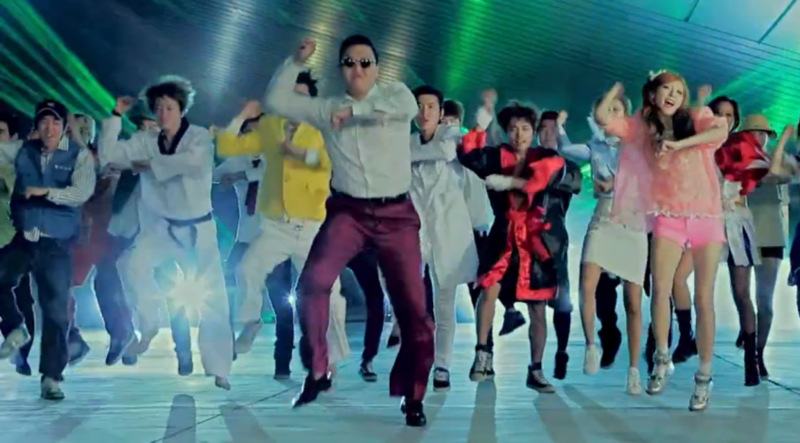 I know it’s very easy to say today, but Psy has really put in a lot of energy in the song. His voice, his dance moves, his expressions of the face – they all show off his enthusiasm towards music. Even if the people won’t understand the wordings, they do understand the music, which is quite passionate and enthusiastic. In order for the video to be an international hit, it first had to be a hit in South Korea. So they decided to bring in three popular personalities of the country into the video, apart from Psy himself. First was a seven year old boy named Hwang Min Woo, who had appeared in Korea’s Got Talent 2 and some other shows in the country. 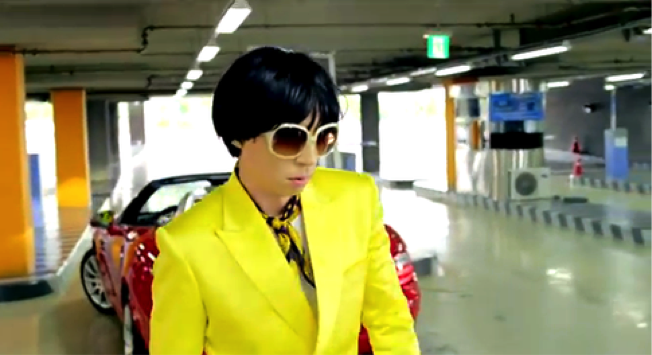 Then the second one was Yoo Jae-suk, a popular comedian and TV host of the country, who appears in a dark yellow suit in the video. And the third one is No Hong-chul, the person who has been famously called the elevator guy as he appears in an elevator in the video. He too is a comedian and a show host of South Korea. On the very first day when it was launched, the video garnered 500 thousand views on YouTube. As far as my research shows, Gizmodo was the first mainstream news site to run a story on the video on 26th July, 2012, 11 days after it was launched. Kat Hannaford of Gizmodo wrote just a few lines about it, embedding the video in the article, and linking to the English translation of the lyrics. Then on the 30th of that month Gawker wrote a small article on it. This article got 18 thousand Facebook likes! The headline of the article was – Did This Underground Hip Hop Artist from South Korea Just Release the Best Music Video of the Year? Although the writer Jeff Benjamin talked about its popularity, he also accused Psy of stealing some dance moves from LMFAO. This caused some controversy in the blogosphere. Many articles and comments were written defending Psy, saying that Psy had been around much before LMFAO. Controversy causes discussions and thus gives more visibility to the object in question. I believe the Billboard article was one of the prominent reasons which drove traffic to the video. The official YouTube blog, YouTube-Trends, ran a story on August 7th 2012, calling Gangnam Style the international hit of the month. Then the video was featured in a lot of other big media publications. However Psy and YG had a trump card up their sleeve which they played out on 3rd September. A video was uploaded on Psy’s official YouTube channel which showed him sharing a drink with Scooter Braun. Braun is a talent manager based in America who had represented the singing sensation Justin Bieber. Although the video was of a poor quality, perhaps shot by a smartphone camera, but it did what it was intended to do. It again attracted a lot of media attention and almost every gossip and music site began to talk about it. Additionally Braun has a coveted contact book and his own artists have some of the largest marketing databases in the world – all of that was now accessible to Psy. Braun managed to get Psy appear at the MTV Awards as a last minute guest. He then made an appearance on the TV show Ellen along with Britney Spears. Britney tweeted about it to her millions of followers (presently she has 37.5 million followers, I don’t know her numbers of September 2012 when the tweet appeared) which resulted in 4,445 re-tweets. Experts suggest that in those days the phrase “Gangnam Style” was tweeted 1.3 million times and they say it can be attributed to Britney’s tweet. LOL, thank u @psy_oppa for the surprise dance lesson yesterday http://t.co/Z7II4W6u @TheEllenShow was going off Gangnam Style! Speaking of tweets, some other celebrities also tweeted about the video. Undoubtedly these tweets from top notch celebrities with their millions of followers added to the popularity of the video. Then on September 20th, 2012 Guinness World Records published a story saying Gangnam Style has become the new world record holder for the most likes on YouTube. 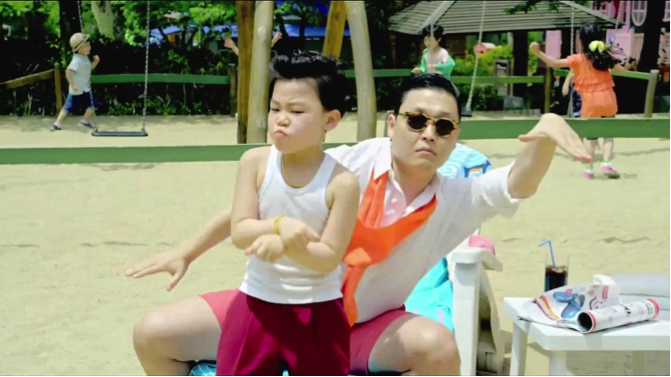 ‘Gangnam Style’, which has only been available to view since the 15th of July, has been ‘liked’ in excess of 2,141,758 times, making it the most liked video in YouTube history. The closest competitors for most liked video on YouTube include LMFAO’s ‘Party Rock Anthem’ (1,574,963 likes), Justin’s Bieber’s ‘Baby’ (1,327,147 likes) and Adele’s ‘Rolling in the Deep’ (1,245,641 likes). All the media coverage and celebrity tweets I mentioned are from the year 2012. However Gangnam Style is in news again and all media houses are talking about it nowadays. The reason is, as I explained earlier, the video has reached two billion views on YouTube, becoming the first one to do that. YouTube trends again has again done a story on it saying the video has earned 100 million views in 2014 alone. So how much has Psy earned from his music video? You see, although viewers are allowed to watch the video for free on YouTube, the website earns money through the ads which are displayed on the page alongside the video. Then the money is split between YouTube and the person who has uploaded the video. Although such data is usually held private by both parties, in a rare disclosure, Google’s chief business officer Nikesh Arora revealed in January 2013, that Psy had generated $8 million in revenues on YouTube alone. 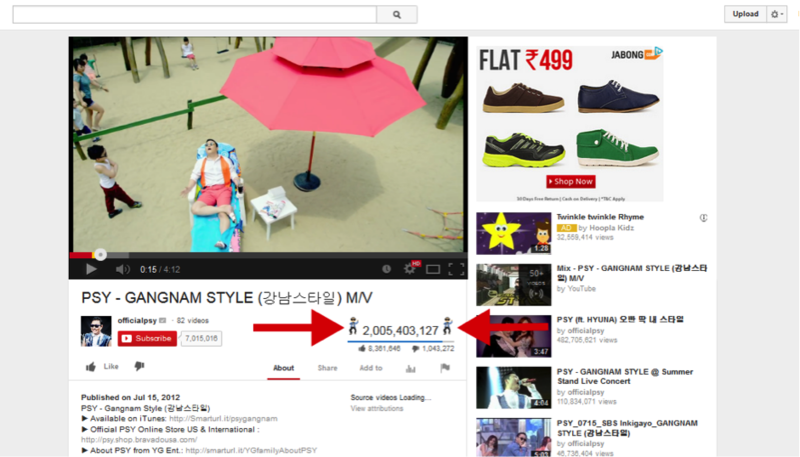 Since about half of that money is given to the video owner, Psy must have got around $4 million from YouTube. Celebrity Net Worth reported in December 2012 that the song had been downloaded by three million people on iTunes which would have generated roughly $2.6 million for Psy after deducting the 30% commission of Apple. Then the site says he must have earned around $200,000 from streaming plays on Pandora and Spotify. Additionally, Psy has been approached by some big names like LG and Samsung to endorse their products. The site estimates that Psy must have got $5 million from such deals. Ironically, Psy sold only 100,000 of the physical CDs of his music album until December 2012, Celebrity Net Worth reports. I have tried to give you a comprehensive outlook on the success of Gangnam Style. I hope you would have found some useful tips and methods in here which you can apply to your business. Do leave a comment below if you have any questions and I will try to answer it. Also, do tell me have you watched Gangnam Style video? Do you think it is really worthy of two billion views? Do you like Psy or do you prefer Justin Bieber? Tell me, I am curious.